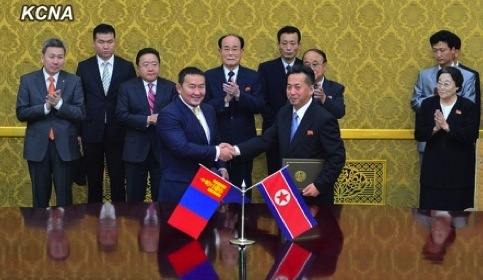 Mongolian Minister of Industry and Agriculture Khaltmaa Battulga (L) shakes hands with DPRK Minister of Foreign Trade Ri Ryong Nam (R) after signing an economic cooperation agreement at Mansudae Assembly Hall in Pyongyang on 28 October 2013 (Photo: KCNA). DPRK Minister of Foreign Trade Ri Ryong Nam and Mongolian Minister of Industry and Agriculture Khaltmaa Battulga sign an economic cooperation agreement in Pyongyang on 28 October 2013 (Photos: KCNA screen grabs). 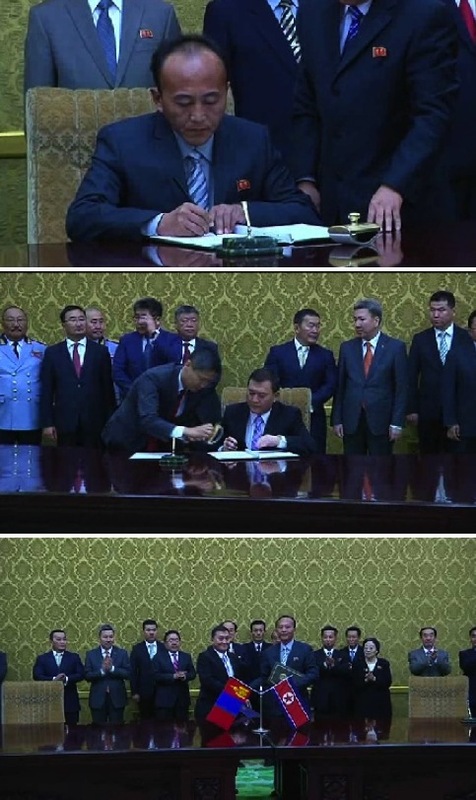 Chair of the Korean Committee for Cultural Relations with Foreign Countries Kim Jong Suk and Mongolian Minister of Foreign Affairs and Trade Luvsanvandan Bold sign an agreement on sports and cultural exchanges and tourism in Pyongyang on 28 October 2013 (Photos: KCNA screen grabs). 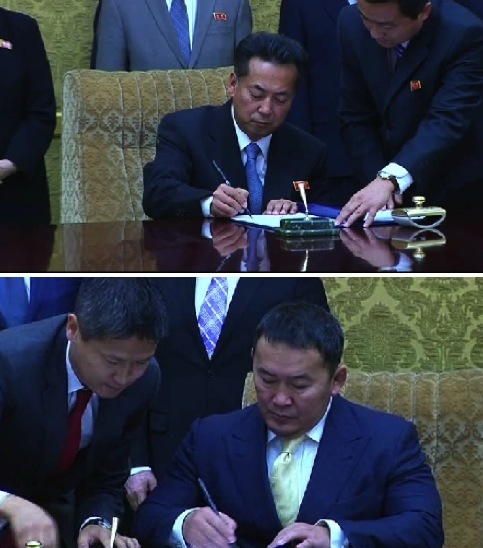 Deputy Director-General of the DPRK General Bureau Software Industry Jong Song Chang and Mongolian Ambassador to the DPRK Manibadrakh Ganbold sign a technology exchange agreement effective from 2013 to 2015 in Pyongyang on 28 October 2013 (Photos: KCNA screen grabs). 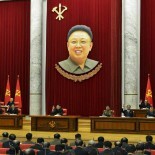 This entry was posted on 10/29/2013 by nkleadershipwatch in 2013 Mongolian Presidential Visit (Elbegdorj), Central Committee, central party life, Choe Tae Bok, critical infrastructure, dprk attorneys, DPRK Cabinet, DPRK Diplomat Corps, DPRK Energy Policy, DPRK External Relations, DPRK Intelligence Community, DPRK Legal System, DPRK-Mongolia Relations, Economic Complexes, Financial Planning Department, General Bureau of Software Industry, International Department, Kim Yong Nam, KJI Personal Secretariat, Korea Foreign Investment and Economic Cooperation Committee, Korean Committee for Cultural Relations with Foreign Countries, Korean Workers' Party (KWP), KWP Science and Education Department, land and enviroment, Light Industry Department, local people's committees, Ministry of Agriculture, Ministry of Construction and Building Materials Industry, Ministry of Culture, Ministry of Education, Ministry of Food and Procurement, Ministry of Foodstuffs and Daily Necessities, Ministry of Foreign Affairs, Ministry of Foreign Trade, Ministry of Land and Environmental Protection, Ministry of Land and Marine Transport, Ministry of Oil and Gas, Ministry of Physical Culture and Sports, Ministry of Post and Telecom, Ministry of Railways, nason, North Korean press, Pak Ui Chun, Political Bureau, Provincial Party Committees, Provinicial People's Committee, Rajin-So'nbong People's Committee, Raso'n Economic Zone, Ri Ryong Nam, Secretariat, State Physical Culture and Sports Commission, State Planning Commission (SPC), Supreme People's Assembly, transportation.